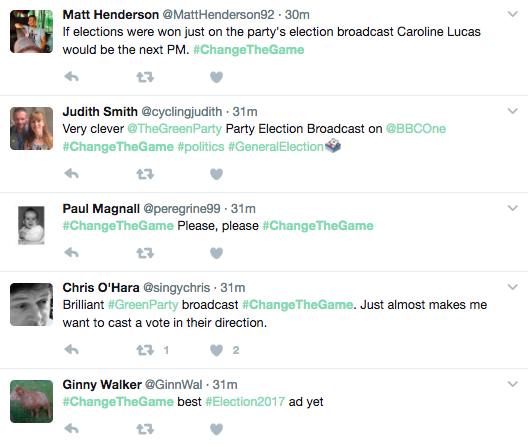 When Theresa May announced a snap general election, the Green Party scrambled into action to get together a party election broadcast. Because of the nature of a snap election this meant us writing, shooting and supplying the ad in under 2 weeks. MENTAL, right? But due to an excellent and committed team we managed to get it done, and have a lot of laughs along the way. I created a teaser GIF for the Green Party's social accounts ahead of the launch. One Twitter user even asked them if their account had been hacked. The Green Party secured an exclusive with Buzzfeed to launch the ad, which was later broadcast on the BBC, ITV, Channel 4, Channel 5 and also shown on Sky News. The ad also got a special feature on Gogglebox. And I made a bunch of GIFS for the Green Party to use on social media.